Daily Illuminator: Worlds Collide, And Adventure Awaits! August 14, 2018: Worlds Collide, And Adventure Awaits! What do you get when you combine the excitement of The Fantasy Trip (live now on Kickstarter!) with the fun of the fan-favorite Dungeon Fantasy Roleplaying Game? An old-school experience to remember! Pyramid #3/118: Dungeon Trips offers goodies of interest to both RPGs, including a dungeon from David L. Pulver that presents some classic monsters from the two games (with stats for either); a random-encounter creator that provides inspiration with the roll of some dice; an adventure outline that subverts the idea of a countdown to save the day . . . and more! 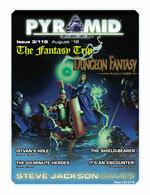 With this issue of Pyramid, you're set for adventure regardless of how you like your classic crypt-crawling campaigns. Download this issue today from Warehouse 23!